Welcome to Elements of Nature. We design and build Natural Swimming Pools and Living Pools in the South of England. Natural Pools and Living Pools are a safe, chemical-free architectural compliment to your beautiful garden. A Natural Pool complements nature and will fit in seamlessly to give a year-round interactive centrepiece to your garden that will be appreciated by family, friends and nature alike. Natural swimming pools with no chemicals; simply the elements of nature. Living Pools can have the design flexibility and quality of a standard swimming pool, without the chemicals. Enjoy that unbeatable feeling of swimming in a natural swimming pool in chlorine-free, crystal-clear water. 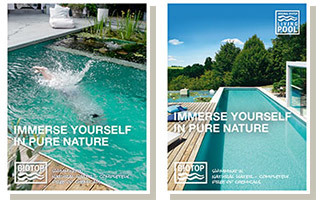 If you are interested in a Natural Pool or a Living Pool you can find out more by looking through this website, taking a look at the BIOTOP website or by ordering a brochure. Why a pool from BIOTOP? Biotop Natural Pools from Martin Haswell on Vimeo.